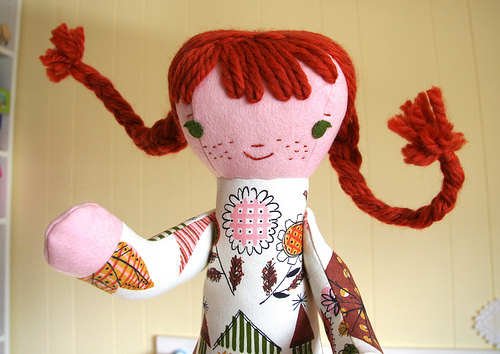 I made a Pippi Longstocking doll for Phoebe. (see notes below and in comments) I thought she’d get a kick out of her poseable braids – instant updo! She’s in Phoebe’s room right now, playing around, waiting for her to come home. I really want to knit her something. Some sort of wonky uneven sweater. I don’t have the right yarn though. We’ll see if I can get my hands on some before the March sisters hair yarn arrives. notes: I used the Elise/Elsa pattern but added full head of yarn hair instead of just bangs. Also she has bent button joint arms instead of the straight arms. Body is wool felt and vintage heavyweight cotton fabric. Legs are quilting cotton fabrics, hair is this yarn. I used floral wire through the braids to make them bendable. She’s lovely! Posable braids is a stroke of genius. Hilary that is AMAZING! So awesome! Socks! Pippi needs striped socks! But that might just be my opinion. Oh! That is so sweet. I love Pippi Longstocking. So wonderful! Makes me want to read it again, right now! How did you do the braids? This doll is making me sad that my two boys have no interest in dolls. Maybe I need one for myself. LOL!! I LOVE PIPPI!! 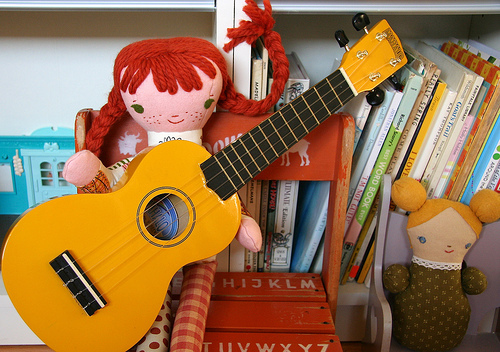 Your doll is adorable–especially the bendable braids. Brilliant. Maybe you could knit her some mis-matched socks. BTW:: Happy Belated Birthday! My son was born on the 6th too. We celebrated with Grace’s homemade yummy cupcakes yesterday and danced to the Baguette Quartette. I love her! I wish my hair could do that! 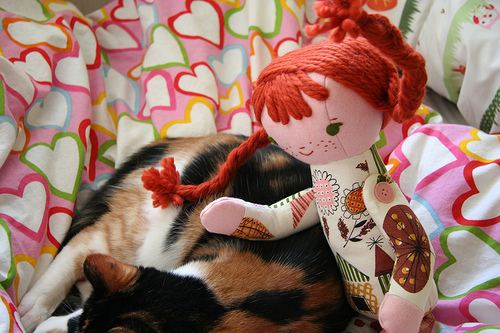 OH… the Pippi Lockstockings doll is adorable. I love how you did her hair… not just her braids being posable, but also how you made her bangs/fringe. Lovely work! What is that fabric? I love it! Love her. The body fabric is just perfect, and the freckles, too. Brilliant! Do the arms move? How did you do that?? thanks! vintage fabric that I’ve had forever, one of my favorites. I gave her button joint arms instead of sewing them in place this time. I tried to make button joints at the elbows too but it looked too funky, distracting, so I made her one piece arm bent instead. Oh Hillary she’s so so fab! I hope you’ll do a pattern for this one? Or will you be working on another book at some point? I’d love it!! Oh my! How much I love her! Pippi was always my favorite. Genius braids, she has. Also, I wanted to say, though it’s not at all related, how sweet your dolls with Land of Nod turned out. I bought two of them and they are so cute! I love your work! So inspiring. However did you find the time to begin making so many wonderful things? I’d dream of doing that someday! for now I’m just following other people’s patterns.